One of the most common Christian doubts is not whether or not God exists or is real, and it’s not whether or not Jesus died and rose again. It’s a sense a ‘I don’t deserve to be saved’. ‘I’m not good enough for God’s love’. I know that because I have experienced it. I know friends who have experienced it. I’ve worked with people and met people in so many different churches or small groups or even pubs who have felt this way. Sometimes it can be tempting to skip from the pain of Good Friday to the celebration of Easter. That’s not what today’s blog is about. Sometimes we can feel that worship music is a bit too… happy. It’s great, it’s wonderful in helping us to express praise and adoration. But sometimes it doesn’t deal with our own sense of inner darkness. Now, this song below won’t be for all of you. But I’ve found it’s raw and visceral nature combined with the moments of softness and beauty has made it a really helpful song for me at times. The Band are called Oh Sleeper, a named from that bit in Ephesians: Arise Oh Sleeper from the Dead. The song is called A Banquet for Traitors. Give it a listen, the lyrics are below. Stand up, these feet are so far from clean. I’m undeserving of the strength in your arms used to save me. But years passed when I saw Eve next to me, she’s wrapped in low-cut, dripping sensuality. I remember the host, but it’s been so long since we spoke. placed here between a thief and a liar. “Just run and hold perfection in your arms as I slip…” but I’ll make you the god of a liar cause I’ve been both a saint and a viper. I’ll make you the god of a liar. I am a lie, just like these traitors that cry for forgiving replies but keep their grips held tight. Though my eye’s on Eve you’re ready to bleed as if I’m royalty but I am no king. I am no king. His life spilled like a tide so divine. It was a blood soaked feast that never ceased as his veins dripped empty. “What makes you think you can deserve me? “My son, you can hold perfection in your arms if you wish.” but I sit at a banquet for traitors, placed here between a thief and a liar. By grace uneven, at the banquet portrayed, through death, this life is saved. The Band Logo: One of the band’s main songs is The Finisher where there refrain is ‘Cut off your Horns’ – speaking to the Devil. This is a reference to Psalm 75.10 “I will cut off the horns of all the wicked.” Ordinarily, the two upper points of an inverted pentagram represent the devil’s horns. 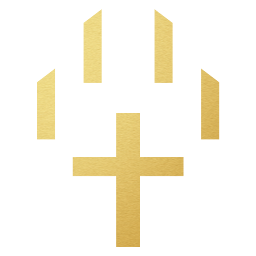 The logo, then, is not a ‘satanic’ symbol but rather a claim that the devil has lost his power – thus a very ‘metal’ way of declaring a key aspect of Christian Faith. If you’re viewing this by email then you’ll need to open the post in a browser to listen to the song.